With thousands of fat, oil and grease (FOG) related sewer spills every year, fat has become the enemy of water authorities world-wide and the UK is no exception. Thames Water has estimated that currently over 100 tonnes of fat are poured down the capital's sinks every day. And it's not just the restaurants and cafes that are the culprits, but ordinary householders too. Pouring the fat from a Sunday roast down the drain is also adding to the problem. Thames Water says it clears more than 100,000 blockages from sewers on a yearly basis and believes that over half are caused by solidified fat. Speaking on a BBC London radio programme back in January Peter Spillett, Thames Water's Environment and Quality Manager said, "Hot fat pours down sinks easily, but it quickly solidifies, causing blockages to sewer pipes. The smaller pipes close to customers' homes are most likely to be affected, risking blocked drains and flooding. If the fat blocks the main sewer network it can quickly lead to pollution of rivers and streams." Further evidence comes from the USA. Barry Newman, a reporter at The Wall Street Journal, said in an article published in June 2001, "America's sewers are in a bad way. Three quarters are so bunged up that they work at half capacity, causing 40,000 illegal spews a year into open water. Local governments already spend $25 billion a year to keep the sewers running. The Water Infrastructure Network, a coalition of the wastewater aware, warns that it will cost an additional $20 billion a year for the next 20 years to keep them from falling apart. "Tree roots, corrosion, cave-ins, bottles, rusty car parts, almost anything will divert sewage on its way to the treatment plant. But the blockages now are almost all enveloped in fat and the main perpetrator is fried food." The major problem is that solids stick in fats and pipes slowly occlude. The fat hardens; chunks break off and flow down the pipe and can jam in the machinery of underground pumps. That, to use a more digestible metaphor can cause a municipal heart attack. There's also the problem of FOG coating and enveloping pumps in sewer lines, causing overheating and eventual burn out; replacement costs are expensive. 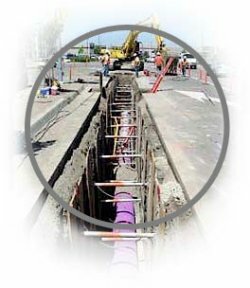 The cost of FOG related issues, above ground and in the sewer network, is hard to quantify, but a look at the knock-on effects demonstrates that there are substantial savings to be made from professional pipeline and drain line management. On the commercial side, how much does it cost restaurants and fast food franchises in unbudgeted and emergency plumbing call out costs? Drains will be unblocked, albeit temporarily, before blockages reoccur and more money is spent to alleviate the problem. The only winner here is the plumber! Pipe work can be damaged with the overuse of caustic agents, chemicals and rodding and there's the environmental issue of putting chemicals 'down the drain'. Then there's the environmental health problem associated with pipeline backups. Raw sewage in food preparation areas is not a good idea and someone has to clean up the resultant mess. That's either the staff or a specialist company; either way it's more expense and what of the damage to the reputation of the food purveyor? For water companies the costs can be horrendous. 50,000 fat-related sewer blockages annually in the Thames Water region; (that's nearly 1,000 a week) and requires a lot of manpower. Repairs to main sewers may be required as a result of serious blockages and the cost of repairing major items like pumping equipment that fails due to an ingress of fat can run into 000s. So, is there a way to alleviate the problems associated with FOG in drains and sewer networks? We believe that there is and that we can effectively treat other compounds such as starches, sugars, and gelatines, as well as odour problems related to these compounds. In fact, during the research and breeding of the FOG related bacteria, Environmental Biotech scientists discovered almost by accident, a bio enzyme that totally removes the smell of urine by eradicating the uric acid crystals that cause the odour. Environmental Biotech offers is a proactive service approach that applies a management discipline to solving problems before they occur. It is much better to have no drain backup at all, rather than deal with it after it has happened, overflowed and caused major inconvenience. When taking responsibility for the management of our clients' drainage system, our role is to remove the hassle in order that they can focus on what they do best, which is run their businesses profitably. The Grease Eradication System (GES®) uses 'bioremediation' to eliminate waste grease and oil, safely and efficiently. Using billions of live vegetative bacteria that feed on FOG, they are introduced into pipe work and drains and immediately begin consuming the waste, converting it into harmless carbon dioxide and water. Because they are live organisms they can be introduced on site, in the immediate vicinity of a problem where they can begin work in an instant. For commercial operators in the food sector, a major tool in the long term maintenance programme is the installation of a system that injects live vegetative bacteria into the pipes and drains twelve times each day. The reservoirs containing these short-lived bacteria are replaced every fourteen days. The environmentally friendly process of bioremediation ensures that the drain lines stay clear and flowing, helping to keep a facility up and running and on budget, without unexpected emergencies and unbudgeted emergency calls. By removing the FOG problem at source we are also helping water authorities further down the line, as eventually this will result in less blockages in the sewer network. The Grease Eradication System has been developed over almost two decades by Environmental Biotech and is now being used in many countries across the globe including Australia. Many water companies and organisations with wastewater issues have benefited from this technology, which is recognised by the US Department of Agriculture (USDA), DEFRA in the UK and many local and state water authorities in Australia (see "Our Credentials and Approvals"). We already provide these products and services to water authorities around the world. We can also help with Hydrogen sulphide reduction in the sewer system.